Sam is a member of the firm’s litigation department, focusing primarily on the areas of real estate litigation, contract disputes, business disputes, landlord/tenant issues, and misdemeanor criminal defense. In addition to his work as a litigator, Sam also handles a variety of transactional matters, including real estate closings, contract drafting and negotiation, and representation for local homeowners’ associations with regard to the enforcement of covenants and restrictions. A native of Fayette County, Georgia and a graduate of Fayette County High School, Sam holds Bachelor of Arts degrees in political science and philosophy from the University of Georgia. Sam obtained his law degree from the University of South Carolina School of Law in Columbia, South Carolina. 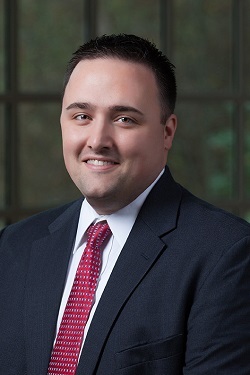 An avid supporter of his local community, Sam actively participates in numerous community associations and has served as the treasurer, secretary, vice president, and president of the Fayette County Bar Association. He is a member of the Fayetteville First United Methodist Church and lives in Fayetteville with his wife, Hannah, a school teacher for Coweta County public schools, their son, Weldon, and their daughter, Emma Kate.